Suitable for installation at Vehicle,Study Room,Desktop table(personal space). office (personal space)study area etc. Kills germs, viruses, fungi and bacteria at more than 88.5%. Eliminates odors, vapors, cigarette smoke and other peculiar smell. Emits negative ions to improve air quality. High quality standard: Passed the Walmart consumer test. 99.2% and VOC’s at more than 73.2% . High ion output: More than 6 millions for better health. One of the special features of this machine lies in the advanced 5-stage filter system, which comprise of High-Performance HEPA Filter, Activated Carbon Filter, UV Light, Photo-catalyst Filter and Negative oxygen ions. High-Performance HEPA Filter(White)- A must have technology for those suffering from allergies and asthma, effective in eliminate harmful airborne particles as small as 0.3 microns including dust, pollen, bacteria, pet dander viruses as well as other harmful airborne germs and pollutants efficiency up to 99.97%. 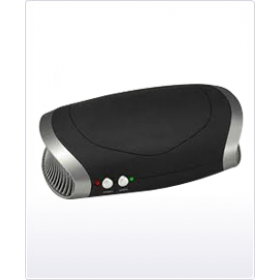 Activated Carbon Filter(Gary) -Specializes in capturing and neutralizing chemicals, gases, odors and cigarette smoke, which the Hepa filter cannot capture. The most effective filters for absorbing odors, toxic gases and hazardous chemical fumes including cigarette smoke and everything from paint fumes and toilet odors to poison gases..
UV Lamp - Germicidal UV lamp Kills micro organisms, bacteria, fungi, virus and other pollutants. At the same time it prevents the reproduction of micro organisms collected by the HEPA Filter. Photo-catalys Filter(Gary) - Effectively reduce the growth of harmful micro organisms, household fungi, bacteria, viruses, dust mites and a variety of odours.